Do you have any videos that show how to properly use any of the products that are available on this site? I live at the edge of the woods in a fairly consistently wet area. I have a problem with carpenter ants. I have tried KM ant pro bait stations with limited success I would like to try a fipronil product but I would like to how someone with the same pest applies it successfully. The product videos are primarily for information only. They usually don't contain any specific treatments for pests. They are available on our You Tube Channel at www.youtube.com/epestsupply. Termidor foam has to be applied directly into the areas where carpenter ants live. So if you know where they are living or where the nest is, you can apply Termidor foam into this area to kill them. It can be injected into walls, switch plates, cracks, crevices, etc. The foam only thickens for a short time, much like shaving cream, then dissolves into water. It does not stay thick for long. Its purpose is to allow the fipronyl time to soak into wood, etc. There is no single way to do this, that's why there are not many videos online on what to do. 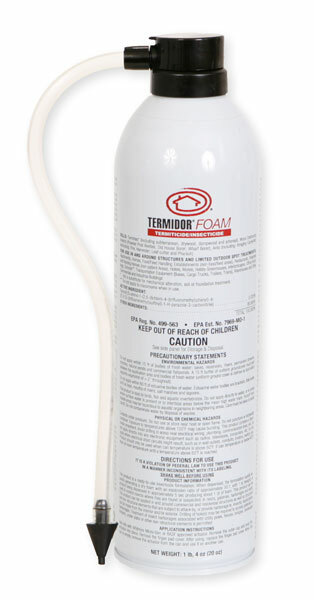 Termidor foam has multiple uses and applications. If you don't know where the ants are you are better of with the KM Ant Pro dispensers. Be sure to replace the bait every 90 days.